Definition at line 854 of file xmlstorage.h. Definition at line 1013 of file xmlstorage.h. Definition at line 984 of file xmlstorage.h. 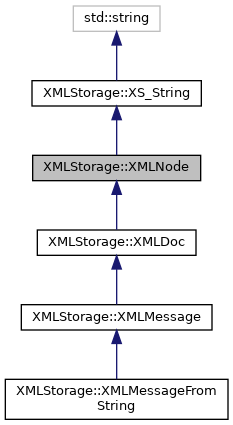 Referenced by XMLStorage::XMLNode::Children::copy(), create_relative(), filter(), XMLStorage::XMLReaderBase::StartElementHandler(), and subvalue(). Definition at line 990 of file xmlstorage.h. Definition at line 997 of file xmlstorage.h. Definition at line 1015 of file xmlstorage.h. Definition at line 1030 of file xmlstorage.h. Definition at line 1067 of file xmlstorage.h. Referenced by XMLStorage::XMLPos::add_down(), XMLStorage::XMLPos::create_node_content(), and subvalue(). Definition at line 1038 of file xmlstorage.h. Definition at line 1244 of file xmlstorage.h. Definition at line 301 of file xmlstorage.cpp. Definition at line 279 of file xmlstorage.cpp. Referenced by XMLStorage::XMLPos::create_relative(), and set_sub_content(). Definition at line 1106 of file xmlstorage.h. Referenced by XMLStorage::XMLPos::erase(), and XMLStorage::XMLNode::Children::remove(). Definition at line 321 of file xmlstorage.cpp. Definition at line 338 of file xmlstorage.cpp. Definition at line 251 of file xmlstorage.cpp. Definition at line 265 of file xmlstorage.cpp. Definition at line 1095 of file xmlstorage.h. Referenced by XMLStorage::XMLPos::get(), XMLStorage::const_XMLPos::get(), and XMLStorage::const_XMLPos::operator(). Definition at line 1171 of file xmlstorage.h. Definition at line 1176 of file xmlstorage.h. Definition at line 1161 of file xmlstorage.h. Definition at line 1166 of file xmlstorage.h. Definition at line 1182 of file xmlstorage.h. Definition at line 1261 of file xmlstorage.h. Referenced by XMLStorage::XMLPos::go_down(), and XMLStorage::const_XMLPos::go_down(). Definition at line 1188 of file xmlstorage.h. Definition at line 1051 of file xmlstorage.h. Definition at line 1089 of file xmlstorage.h. Definition at line 528 of file xmlstorage.cpp. Definition at line 555 of file xmlstorage.cpp. Definition at line 579 of file xmlstorage.cpp. Definition at line 1083 of file xmlstorage.h. Definition at line 1073 of file xmlstorage.h. Definition at line 1199 of file xmlstorage.h. Definition at line 1205 of file xmlstorage.h. Definition at line 612 of file xmlstorage.cpp. Definition at line 1112 of file xmlstorage.h. Definition at line 1123 of file xmlstorage.h. Definition at line 1221 of file xmlstorage.h. Definition at line 980 of file xmlstorage.h. Definition at line 979 of file xmlstorage.h. Definition at line 981 of file xmlstorage.h. Definition at line 982 of file xmlstorage.h. Definition at line 1271 of file xmlstorage.h. Referenced by clear(), erase(), get(), get_attributes(), operator=(), operator(), original_write_worker(), and put(). Definition at line 1282 of file xmlstorage.h. Definition at line 1270 of file xmlstorage.h. Referenced by add_child(), clear(), count(), XMLStorage::XMLPos::delete_this(), filter(), get_children(), get_first_child(), operator=(), original_write_worker(), remove_children(), XMLStorage::XMLDoc::write(), XMLNode(), and ~XMLNode(). Definition at line 1274 of file xmlstorage.h. Referenced by clear(), XMLStorage::XMLReaderBase::EndElementHandler(), XMLStorage::XMLReaderBase::finish_read(), get_content(), operator=(), original_write_worker(), set_content(), and XMLStorage::XMLReaderBase::StartElementHandler(). Definition at line 1275 of file xmlstorage.h. Referenced by clear(), and operator=(). Definition at line 1273 of file xmlstorage.h. Referenced by clear(), operator=(), and original_write_worker(). Definition at line 1276 of file xmlstorage.h.